It is perhaps important to maintain some perspective. Carlos Martinez is 25 years old. He was born in the Dominican Republic, and when he was 18, he spent his first year with a Cardinals affiliate. Last month, he agreed to a $51-million contract extension. Martinez is already a massive success story as a professional. Barring some unlikely series of catastrophic decisions, he and his family will never have to worry about money again. We should all be so blessed. So the Martinez path is already something like four or five standard deviations better than the usual. But, you know, we’re bad at perspective. We tend to think of these people as baseball players first, and, say, just last week, we got to glimpse Martinez as a baseball player, pitching in a competitive environment for the first time since signing the multi-year guarantee. I want to show you two pitches I haven’t been able to stop thinking about. In the top of the first in that game between the Dominican Republic and Canada, Martinez exceeded 100 miles per hour with his fastball a few times. Me, I love a good heater, but nothing can compare to a perfect changeup. Above, you see Martinez throw two of them, back to back, to Dalton Pompey. They both clocked in north of 90, and Pompey was left with little chance. The broadcast actually thought the putaway pitch was a sinker until a slow-motion replay showed the particulars of Martinez’s circle-change grip. Martinez threw just nine changeups before coming out. It’s a small sample, then, from the earlier part of March, in one environment under one set of circumstances. But according to Brooks Baseball, the change averaged about 89 ticks, and just shy of 11 inches of horizontal break. No righty starter from last year threw a changeup with that much tail. It’s a rare pitch, in terms of its speed and its shape. And it continues to be an important pitch for Martinez, because of what’s shown in the following table. I calculated those averages by looking at the 139 right-handed starters who’ve thrown at least 50 innings against both righties and lefties over the past two years. Martinez has allowed a wOBA against righties 65 points better than his wOBA against lefties. This is supported by big differences in his peripherals. Against right-handed batters, Martinez has been close to the league leaders in all four statistics. When Martinez has had the platoon disadvantage, he’s been around the middle of the pack. We can stop here real fast. Obviously, there’s nothing too terribly wrong. 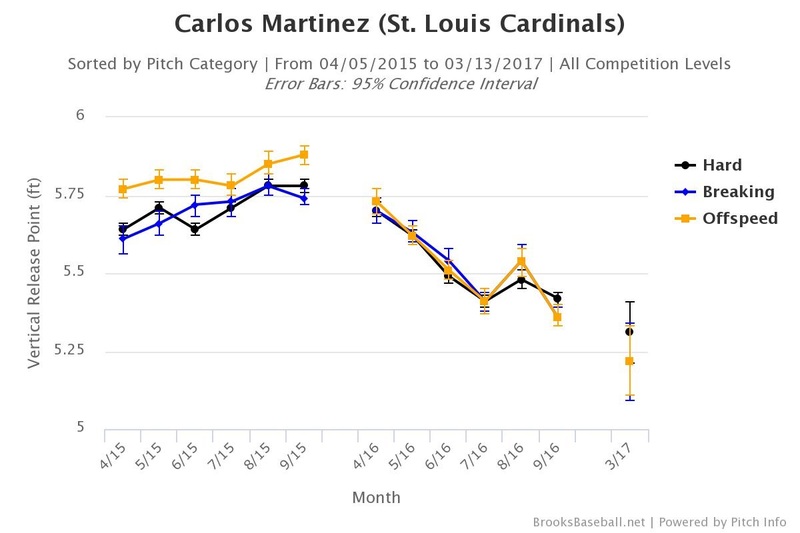 Martinez has already been a quality starter by disproportionately maiming other righties. Yet you can imagine another level, even just by eyeballing his stuff. If Martinez were to reach that level, one clear route would be getting lefties out more often. Martinez has lowered his arm fairly significantly, and if we can trust the WBC data, the trend has continued. The general rule is that, the lower the arm slot, the wider the platoon splits. Opposite-handed batters get to see the ball longer, and the sinker Martinez was throwing to Team Canada most closely resembled Charlie Morton’s sinker from last season. Morton’s always had problems with lefties. Getting a bunch of horizontal movement is a neat trick, but if anything, Martinez lowering his arm could make him more exploitable. Early on, Martinez was more to the third-base side. He gradually moved over, which might’ve been an attempt to compensate for the lowering arm. Moving on the mound is about changing attack angles, and it’s possible Martinez could find the most comfortable angle possible to put lefties away. 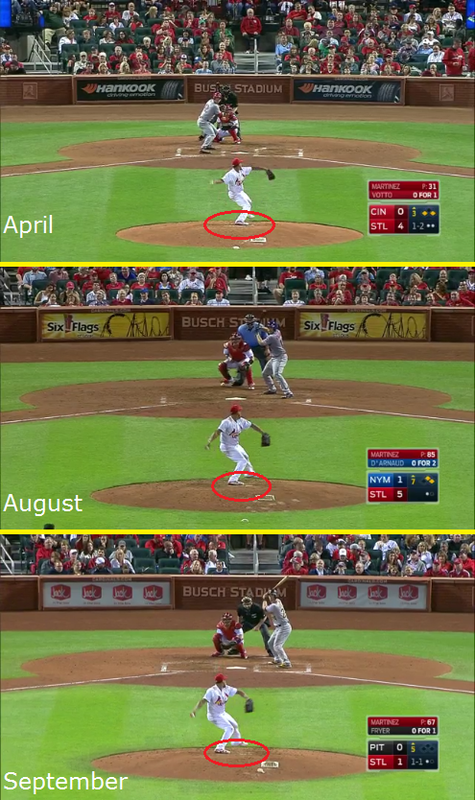 By moving over, maybe Martinez will be better able to locate over the inner half. Maybe it’ll just make the ball that much harder to pick up. And we shouldn’t forget the other possibility that, maybe, nothing will change. Martinez is still a work in progress, in this respect. He’s already developed into a wonderful starter, but lefties still see him a lot better than righties do, and that’s the one thing left Martinez has to tackle. One more note I ought to acknowledge: Martinez doesn’t have to improve against lefties, especially if these new angles continue to give righties fits. All the tail Martinez gets on his pitches, the lowered arm slot — if he’s just total death to righties, then he could follow the Max Scherzer route toward ace-hood. While Scherzer tends to run large platoon splits, his baseline ability is so very high that even the worse version is good. This is legitimately realistic. Could be, then, that’s an even better plan. Could be that’s the plan already in motion. Ask the Cardinals, though, and I bet they’d tell you they’d like to see Martinez get more lefties out. When you see his best changeups, you wonder how he ever gets touched. Yet he pitches almost like a righty specialist. Just because Martinez got a big guarantee doesn’t mean he’s a finished product. We hoped you liked reading Carlos Martinez Has One Issue Left by Jeff Sullivan! Exciting to think that the best is yet to come for Martinez. Do you think he has Scherzer’s K upside? I recently read that Martinez has made a concerted effort to throw fewer pitches and generate contact instead to shorten at bats. I would to see an as-comprehensive-as-possible study of pitchers who “try to generate contact” instead of going for strikeouts. Even a 2015 vs. 2016 comparison of Chris Sale would be interesting. Because I don’t really know what that statement actually translates to. I mean, higher zone rate is the obvious indicator, but obviously not all places in the zone are equal. If going for contact means grooving more pitches, then that is just pitching worse. And, if a pitcher is already up 0-2 or 1-2 (which he often will be if he is throwing more strikes) well then obviously a pitcher ought to go for a strikeout because it doesn’t even have a pitch penalty. Is it a pitch mix thing? More fastballs and sinkers? But many secondary pitchers are actually better and generating ground balls than even a sinking fastball. What I’m really trying to say is that statement makes no sense to me. I’m not trying to rant on you, Rollie, it’s the pitchers and coaches who say this who I am trying to understand. Definitely a fair point. I’m sure there would be all kinds of rhetoric about nibbling on the corners, attacking hitters or working low in the zone. It’s possible that “pitching to contact” is simply a justification of pitching ability/style rather than a conscious decision to not miss as many bats. yeah, I mean Clayton Kershaw has said he doesn’t pitch for the strikeout, but what he clearly does is pitch as optimally as possible. that leads to more favorable counts, less contact in unfavorable counts, and of course, whiffs on two-strike counts. another thing I never got was why pitching to contact is more “efficient”. more strikeouts mean fewer baserunners which means fewer pitches per inning. Clayton Kershaw, the premier strikeout pitcher in the game, also leads baseball in innings per start every year, for that reason (and because he doesn’t walk anyone). but more generally, the pitchers with the most innings every year also typically have very good K rates. Ks do cost more pitches per batter, but that’s almost perfectly offset by fewer batters per inning — so in the end, there’s no difference in pitches per inning among today’s high-K and low-K pitchers. I took all those with 100 IP last year and sorted by K%. The top 20 in K% averaged 3.96 pitches per batter, while the bottom 20 averaged 3.74 — but both averaged 16.3 pitches per inning, which was also the average for all 144 pitchers. In times past, chasing strikeouts was more likely than now to create walks. But with the K/BB ratio at an all-time high, the cost of chasing Ks is reduced. Good points. But the pitchers w/ the most innings, could never get that many innings if they weren’t K out guys. I think they go hand in hand really and that’s probably part of your point as well. I don’t know, I think every year, if you’re one of the guys eclipsing 200-210 innings you’re probably at least an 8.5K per 9 guy. You can’t survive those many innings just on soft contact. Although…Sonny Gray did it for a few years and Julio Teheran is trying his best to now. That and having the stuff to pitch to contact. It’s much easier for Chris Sale and Carlos Martinez to pitch to contact than say…Brandon Finnegan? Someone who’s quality but still needs that swing and miss to get guys out. Sale and CMart stuff is so good they can continually create soft contact by simply trying to blow it by guys. Bip — Sale 2015 vs. 2016 illustrates why this data is so hard to interpret on the individual level. Pursuant to his stated goal, Sale cut his SO% by 6 full points last year (from 32.1% to 25.7%), and his pitches/PA fell from 3.89 to 3.78. And from one viewpoint, it worked perfectly — he trimmed almost one pitch per inning, his ERA held steady, and he worked a career-high 227 IP. But … Was he just lucky? His FIP shot up by 0.73. It took a career-low .281 BAbip (down from .324 in ’15) to keep the ERA flat. How much of that was due to his effort, and how much was luck? But then again … Sale’s yearly pitches/PA do not perfectly track his SO%. In 2015 his SO% reached a career-high 32.1% (up from 30.4% in ’14), yet his pit/PA *fell* from 4.02 to 3.89. His BAbip in ’15 was a career high, by 30 points; his FIP rose a little from the year before, and his ERA rose a lot. What does it all mean? One other observation about Sale’s yearly rates: Since his 2010 debut, his PA/IP had inversely tracked his pit/PA every year until 2016. For 2011-15, when his pit/PA went up, his PA/IP went down, and vice versa. Last year both numbers dropped, which I’ll just guess is rare and more lucky than good. Cardinals fan here. It’s fairly common montra in the past for Cardinals pitchers to pitch more to contact. Strategy of Dave Duncan. For the most part, in my estimation that just means being aggresive early in counts. Making a consertive effort to challenge hitters on the Strike 1, even if it’s a fastball over the plate. Duncan’s idea, has always been changing eye levels and letting the hitter get themselves out, rather than trying to get hitters to chase.